Hearthstone Arena is set to receive a few tweaks in the next patch. Arena players might also notice a couple of new cards to play with. While Hearthstone players grinding on the monthly ladder are preparing for the turnover to the new Standard season, Tuesday saw a few announcements come for the game's Arena players. Hearthstone's Arena mode is about to receive some significant updates, including a few tweaks to the rules and a few new cards. (1) Hand of Salvation (Paladin, Spell): Secret: When your second minion dies in a turn, return it to life. (5) Polymorph: ??? (Mage, Spell): Choose a minion. Discover a new minion to transform it into. (2) Deadeye (Hunter, Spell): For the rest of the game, your Hero Power can target minions. (3) Nature's Champion (Druid, Spell): Return a friendly minion to your hand and give it +5/+5. (3) Blazing Longsword (2/3) (Warrior, Weapon): Also damages minions next to whomever your hero attacks. (0) Bottled Madness (Warlock, Spell): Replace your hand with random Demons. (1) Smoke Bomb (Rogue, Spell): Give a minion Stealth until your next turn. Draw a card. (2) Generous Spirit (Priest, Spell): Choose a friendly minion. Give it to your opponent and draw 3 cards. Other changes include adjustments to the Arena draft. Card choices will no longer be based entirely on rarity, but will now be offered based on relative power level. One example given is that players may have to choose between the powerful Fireball, the defensive Ice Barrier, and the laughable Wisp. The team hopes to offer less choices like that and more choices like Fireball, the spell-discounting Leyline Manipulator, and the area-of-effect damage causing Primordial Drake. This change will be ushered in with the upcoming 10.4 update. 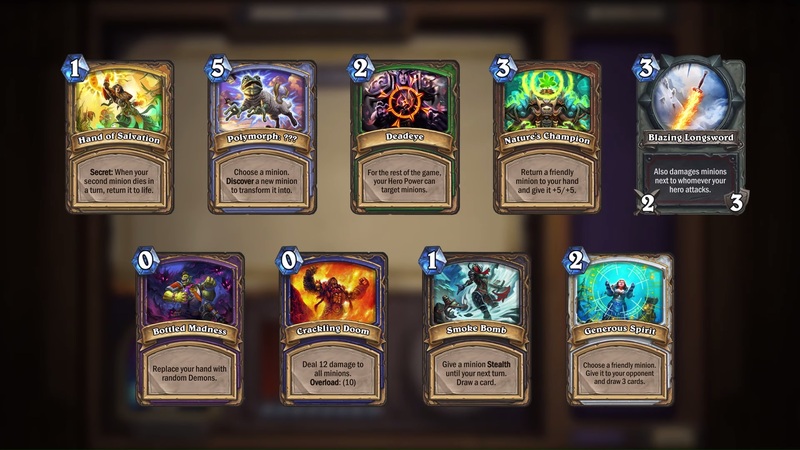 "We've kept all the existing modifiers to increase the chance to see class cards, spells, and weapons," said Hearthstone Lead Systems Designer Kris Zierhut. "But we've decreased the chance to see cards of below average value. Cards of different rarities still have approximately the same chance of appearing they had before the update, but now they'll appear alongside cards of different rarities and of the same approximate power level." No word on when the 10.4 update is coming, but look for it to arrive in the next few weeks. More information can be found on the Hearthstone website. I really wish you could choose which pack you get as your arena reward or better yet it gives you a token you can redeem for the pack of your choice. Even if you're really good at arena the pack is a really important part of the rewards and if you don't get the pack you wanted then that 7 win arena run mostly just gave you dust. But maybe that would make arena too good and everyone would feel like if they don't spend all their gold on arena then they're wasting their gold.